Even in Florida the weather can vary (shocking, I know) and these unexpected changes in temperature can send you back in-doors with cold and flu symptoms. But it doesn't have to! 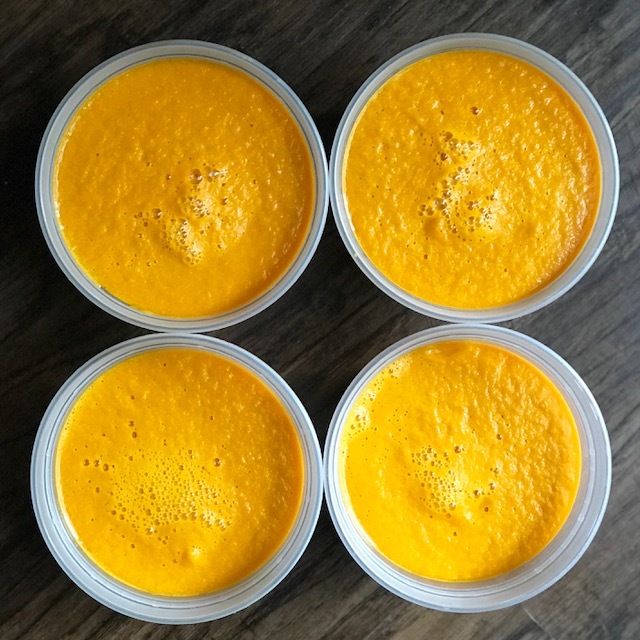 Eat and drink to your health this Fall because while you might not be able to control what's happening outside, you can very well take care of your inside with immune boosting foods like this quick and easy Carrot Ginger Soup. Served hot or cold, this Carrot Ginger Soup will do wonders for your immunity. Ginger, a spicy healing root, has long been lauded for its anti-inflammatory and anti-nausea properties, but how bout them carrots? Carrots are one of the most popular veggies worldwide and can be eaten raw, cooked or juiced. Carrots get their signature orange color from antioxidants called carotenoids, which are known for protecting the eyes and skin. In addition to high levels of vitamin A, most of the benefits of carrots can be attributed to their beta-carotene and fiber content. This root vegetable is also a good source of antioxidant agents (lycopene, lutein and zeaxanthin). Furthermore, carrots are rich in vitamin C, D, E, K, and B8, as well as folate, potassium, iron, copper, calcium, magnesium and manganese. With all these impressive benefits and Fall in the air, how could I not use carrots in a soup? Place ingredients in high powered blender and blend until smooth (approx. 4 minutes). Serve slightly warm or chilled. Garnish with a drizzle of hazelnut oil and chopped cilantro.